Mortality: How often someone dies from "it"
I learned these words 5 year ago when I was employee at The American Cancer Society. Little, did I know I had learned the meaning of these words almost 10 years prior. I had to wait until November to do this post because October is Breast Cancer Awareness month and I have an unhealthy relationship with breast cancer. And no, I don't hate it the way you think I do...I hate it in a different way. It's an almost envious...jealous kind of thing. This is going to be hard to explain but I am going to try. I hope I do it justice in the process. For every type of cancer there is a statistic called the incidence and mortality rate. The incidence and mortality rate is a figure between the whole number 0 and the whole number 1, that relates to how often a type of cancer occurs versus how often a person dies from this type of cancer. The closer the statistic is to the number 0 the less likely a death will occur if one contracts this type of cancer...the closer to 1..the more likely the person WILL die. It's important to understand that the incidence and mortality rate denotes a relationship between occurrence and death. It's NOT just about how often it happens. OR how often someone dies. It's about both. The reason this is important is because certain cancers OCCUR more in the population but do NOT result in death as often as others. Much of this is due to research, money, and awareness. Which brings me to my issue with breast cancer. Breast cancer most definitely has the highest incidence of any other cancer among women...black white yellow or green. But there are others i.e lung cancer that have a higher mortality rate for certain populations, and herein lies the problem. When my mother was diagnosed with lung cancer roughly 20 years ago, there weren't nearly as many options as there are now. People weren't running 5ks and conducting all types of clinical trials. The ever popular Cancer Treatment Centers of America was only about 10 years old. My mother's options were few. After chemo and radiation the cancer spread to her lymph nodes and she was pretty much sent home to die in peace. In keeping with current lung cancer survival rates, she only lived 2 years after diagnoses... and much of that was spent in and out of doctor's offices. She had a hard way to go. The tragedy is that this was 20 years ago and things aren't much different now. In this day and age there is no reason why the diagnoses of lung cancer should STILL mean certain death. Strides must be made to ensure that things improve. Not stay the same. Recently, I had a favorite cousin of mine be diagnosed with breast cancer. The cancer was detected early and after a mastectomy, some other minimally invasive procedures, and 10 months there was no cancer to be found in her body. What's even more surprising is that she was 69 years old when all of this happened. Would you believe that her story is common. Due to research funding and access it is completely feasible that a 69 year old woman can beat breast cancer and 30 year old woman can die within a year's time from lung cancer. My vision is to see a world free of cancer period. But in the meantime, since my mother is not here to fight for herself, I will say what she can't. Help me, help her, help us. Don't be the type of philanthropist that just jumps on the bandwagon to support whatever everyone else is supporting. Do your research and put your dollars where they are needed. I am in no way saying we don't continue to fight breast cancer. Breast cancer is a monster that could have taken someone I love very much. I am just saying there is more the fight to end cancer than pink. 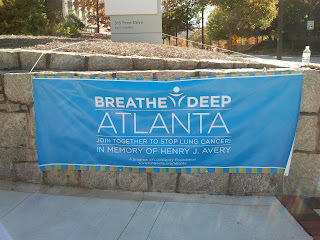 I am convinced that people simply don't know what a monster lung cancer is. So please allow me to shed some light on the subject and dispel a few myths. 1. People don't get lung cancer as frequently as other cancers. FALSE: Lung cancer impacts one in 14 Americans and kills more than breast, prostate, colorectal, leukemia, and melanoma cancers combined. FALSE: Lung cancer is the leading cause of cancer death, regardless of gender or ethnicity. The incidence and mortality rate for lung cancer hovers somewhere around .84 meaning that around 80% of individuals that contract this type of cancer will die from it. FALSE: About 55% of those newly diagnosed with lung cancer are former smokers or people who have never smoked. 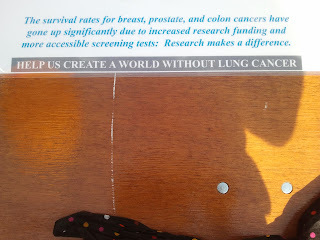 This is to me was one of the most shocking lung cancer statistics that I found. There is a misconception that all lung cancer sufferers are smokers or that they engage in some other behavior that causes lung cancer. This type of thinking causes a huge stigma for lung cancer sufferers, because people automatically believe that victims of lung cancer have brought it on themselves. In contrast to breast cancer, which has no specific risk factor associated with it, victims of lung cancer almost have prove or explain how they got it before they receive the empathic response others receive automatically. It's important that victims of lung cancer be able to appeal to the sensibilities of other people, because most of us donate to causes that illicit some sort of emotional reaction. We have to feel connected either because of sympathy or empathy. But if we feel that it's someone's own fault the likelihood of getting that reaction is smaller. FALSE: Lung cancer kills almost twice as many women as breast cancer, and more than twice as many men as prostate cancer. The 5-year survival rate for breast cancer is 90%, for colorectal cancers 66%, for prostate cancer 99%. The 5-year survival rate for lung cancer is only 16%. The statistics are sobering but one is still left with the question. Why? Why is lung cancer so underfunded and under researched? Why is there not more being done in this area? In my opinion it boils down to survivorship. Breast cancer has a major advantage on lung cancer because far more people live to tell the tale if you will. There are tons of breast cancer survivors who can spread the word about this terrible disease. They can do so from, "a been there done that" perspective. This is not the case with lung cancer. People who get it...die. Period. Yesterday, at the race, I was painfully reminded of this fact when I realized that of the 300 blue "participant" shirts scattered around the crowd, there were only four green "survivor" shirts. What was even more interesting was hearing that one survivor was only able to beat lung cancer because she participated in a clinical trial. For those who don't know trials are sophisticated medical research procedures that oftentimes use experimental medication to treat diseases. The bad thing about trials is that there is no way to know how said drugs will interact with the subjects. Which is more, in order for a trial to be valid there has to be a test group and a control group. The test group will get the real treatment but the control group gets a placebo. Participants are not allowed to know which group they are in. So, there is no way to know if you are truly being treated or just being given an aspirin. Now, admittedly, I have not done a ton of research surrounding clinical trials and how they are administered. I am sure things are much more complicated than what I stated above... but the overall point is the same. It's a toss up... a gamble to say the least. On the other hand, since trials are free, when they do work they can save lives at a minimal cost. It's also important to note that there is a huge racial and socioeconomic disparity in how certain cancers are treated and funded. As you have read, lung cancer does not discriminate when choosing who to attack. No cancer does. But the difference is African-Americans and other people of color do not have the same access to health care that could ensure early detection and early treatment. Beyond that once there is a cancer diagnosis, people of color commonly do not have access to the same type of or level of treatment that other races do. In a study published by the New England Journal of Medicine, it stated that since Blacks are less likely to receive certain surgical procedures during treatment, we have lower survival rates than our White counterparts. The study said that Blacks receive surgery at a rate of around 64% while Whites do at a rate of roughly 76%. The study also found that when comparing 5 year survival rates, the rate for Blacks was lower @ (26.4) vs. (34.1) for Whites. Taking all of the factors you have read about into consideration, it's easy to understand how certain cancers could receive more donor dollars, and more support. However, we must be an informed population when understanding that just because pink is all you see, it doesn't mean that this is the only fight we need to be fighting. As a former employee of an enormous cancer organization I can tell you that far more goes into cancer funding than incidence and mortality rates. Also, lung cancer is an organ cancer, making it increasingly important to be vigilant about preventing it. Human beings can live without breasts and prostate glands, but none of us will survive without our lungs. We have to be able to breathe...to live. In closing, I learned a lot yesterday, some things that were hurtful and some that were empowering. When I was a child, there wasn't anything I could do to help my mom. I am so happy that now I can. I was able to raise $340 for a great cause yesterday and I am so great.ful to everyone who donated to help. 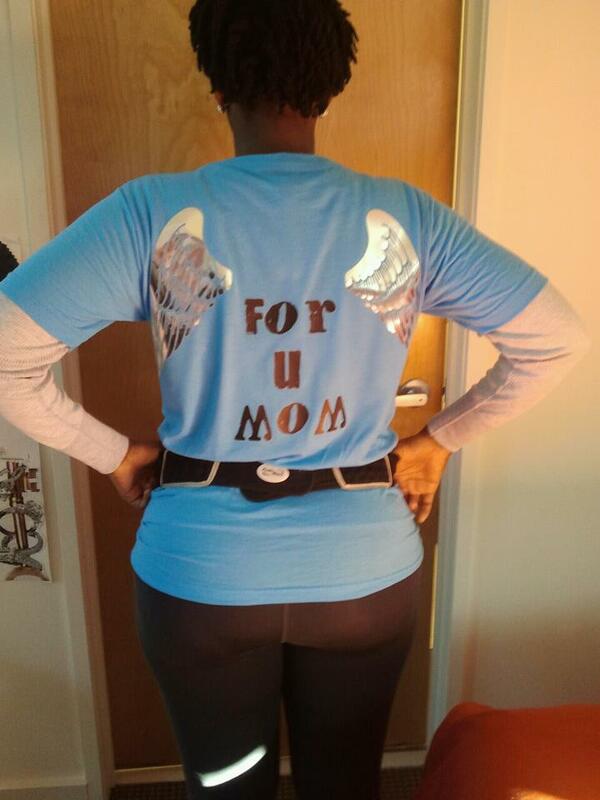 Thanks, Ricci, Jodi, Auntie, Kecia, Vanessa, Cheryl, Andre, Lauren, Tami, Tamekia, Erin, Natasha, Aaron and Michelle. 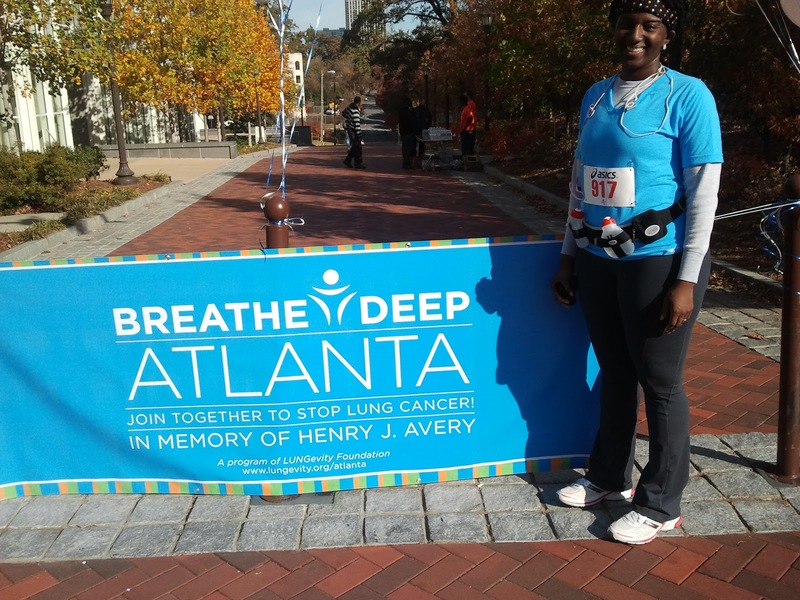 We may be behind in the fight to end lung cancer, but if all I can do is talk about it or run for it, I am willing to do my part. 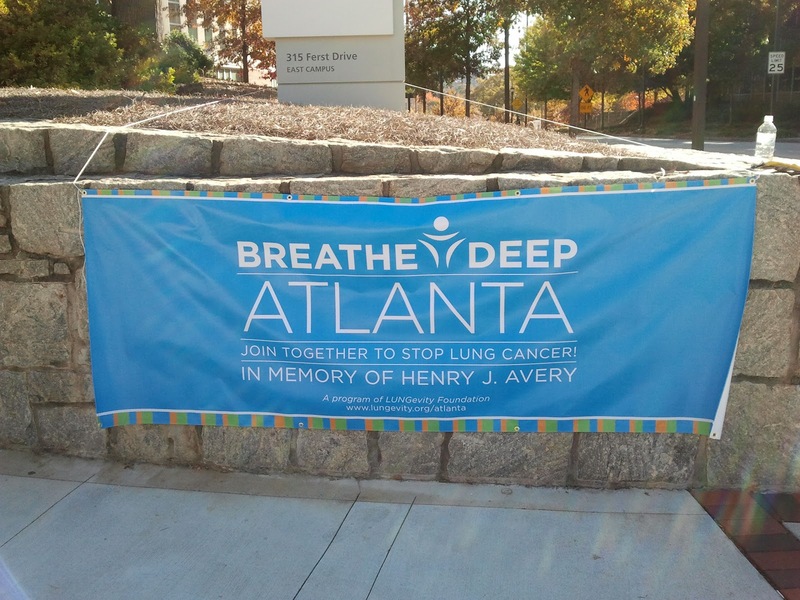 Please visit the following sites for more information on Lung Cancer. Lung cancer facts courtesy of the Lungevity Foundation. I have a question about your blog. Please email me! Cool you write, the information is very good and interesting, I'll give you a link to my site look at this website.